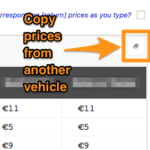 This article gives details on updating prices in bulk using a formula and copying taxi fare prices from an existing vehicle price table. Note; Cab Grid Pro version 5 introduces the ability to import and export taxi fare prices from a CSV file. Cab Grid Pro version 3.8 introduces preliminary work on bulk price updates. This facility allows all prices in vehicle price tables to be updated with one click via a formula. – ALL prices for the selected vehicle (the whole table). – Prices FROM a selected place to all others (a single ROW in the price table). – Prices TO a selected place from all others (a single COLUMN in the price table). To update every price in the table click the icon at the top right of the table. This will open the formula modal box as an overlay. To update all prices FROM a given location via a formula, click the label in the first column for that place’s row (the place name). To update all prices TO a given destination via formula, click the label in the column heading for that place (the place name). Once the formula box is open, you can enter a formula or a single price to update all the prices for the selected group. So, at its most simple, you could set all prices to $10.00. To do this, you would simply enter ’10’ in the formula box and click the green APPLY button. The price for every possible journey will be set to $10.00. This could form a good starting point for further modifications. To remove prices for the selected set, enter ‘0’ in the formula box. This will reset all prices for the selected group. Note: if a formula results in a value less than 0 (e.g. currentValue-100) then these prices will also be considered reset. To use a formula, the variable “currentValue” (as capitalised) can be used. It represents the current price for each individual journey. A calculation will be performed to update each price based on this. The formula accepts common mathematical operators: plus/add (+), minus/subtract (-), multiply (*), divide (/), parenthesis, etc. Each vehicle type added in Vehicles tab has its own price table in the Prices tab. Adding prices for multiple vehicles can be laborious, however it is possible to duplicate complete price sets from another vehicle as a starting point. Combining this with bulk updates via a formula (see above) can speed up price data entry. 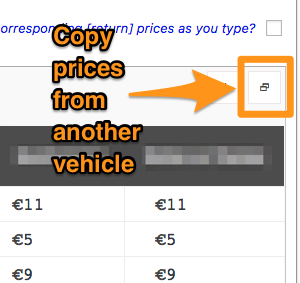 Click the copy icon at the top right of the destination vehicle table (that is the table the prices are to be copied to). A pop-up box will be displayed (see pic below). hi where is the copy icon on version 4.8 pro? You may be confusing the version of WordPress with the version of the Cab Grid Pro plugin. We have recently released version 4.0 of the Cab Grid Pro plugin, while WordPress is at version 4.8. The copy function is only available in Cab Grid Pro v4 (and above). You may be using an earlier version – 3.8? If you are a Cab Grid Pro user an updated version will be sent to you for you to install on your site manually. From version Cab Grid Pro v4.0 on, updates can be automatically applied from the WordPress admin. You will be notified when a new version becomes available.